To see the full presentation click here or click on the image below..
Today I’m presenting a talk at Conversion Elite all about my favourite topic – using analytics to improve success! In this case, I’m focussing on conversion optimisation, but the skills, foundations and processes are very similar regardless of your business and project objectives. Which is rather a lot to fit into a twenty minute talk, hence writing it up here so it can be read at your leisure! 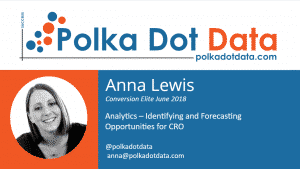 Something you may be used to within the world of Conversion Rate Optimisation (CRO) is the process to come up with ideas, select those to run with and the measure results. But how much of a part does data play in this? Before you think about running tests, I would recommend you ensure you have your foundation data set up well, customised to suit your business and documented so you everyone knows what is measurable. A measurement framework starts by looking at the overall business plans, then working them back to business objectives, then KPIs specific to each area, then the granular data you can measure to enhance this. That’s how you will come to plan the data points that will best suit your business. If you haven’t heard this phrase by now you need to be reading up more on analytics, but regardless of whether you’ve heard it, let’s hope it makes sense and strikes a chord. Think about conversion rate, that favourite metric of so many people. If we look at conversion rate alone, we can monitor change over time, improvements and declines. But how do you know if there is something happening under the surface? Perhaps new customer conversion rate is plummeting, but a loyalty offer for returning customers is pushing the data up so you don’t notice the major crevice opening up with new customers?! Ok, so it might not be that dramatic, but segmentation is essential all year round, and super beneficial when it comes to investigating data. Device type – because no one has the same conversion rate on desktop and mobile! Something I discovered recently to help speed up data extraction with segmentation is Craig Sullivan’s tool ProfitGrid. This quickly shows some of the top breakdowns for your data, allowing you to take a quick look and spot top segments in need of help. A typical forecast might look at sessions or users, then conversions and work to improve conversion rate. But what if you thought about the mammoth level of activity the user has to put in between those two points and hone in on some key engagements that may really affect the success of the journey. After all, those are the aspects you’re likely to be working with on you CRO tests. Think product page – are there drop outs after users select the variant drop down? With this data you can understand intent, problem and solution much better and also review this again between new and returning or device type to see where the problems really lie. Are people not adding to basket because of the pricing? Do my landing pages match user intent? Should I be offering free delivery or click and collect? Am I missing key size or colour variants that could help me gain market share? And how do we get this data you might ask? Event tracking of course! For those using Google Analytics, Event Tracking functionality is still quite under-utilised but such a useful tool for customising the data for your website. You can’t surely expect a web analytics tool to work out of the box for a site like yours, and your competitors, the baker down the street, the national retailer for beds, a world renowned theme park and a sports betting site? 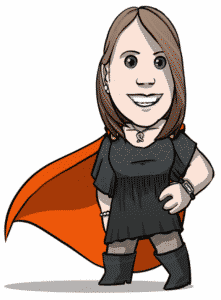 Just to name a few varietieis of website that might be using Google Analytics! They don’t all work the same at all, so each needs customisations to monitor user activity in the way that suits them best. Event tracking is a fantastic way to achieve this, and the slides here go into a little more details about the application of this, but the full implementation is best read up separately to this post. So now that you have this great engagement data to complete the picture, you can make your forecasting more relevant and focussed. Now you’re ready to start prioritising tests! Why do I sound so excited by that I hear you ask!? Well, it’s all about looking at lots of data, all together, comparatively and coming up with a solution that suits your business. So many business decisions are made on opinions of the person with the most voice (HIPPO), without taking the data into account. This can be so infuriating when you know there’s another million pounds revenue available if they made the decision based on the data. 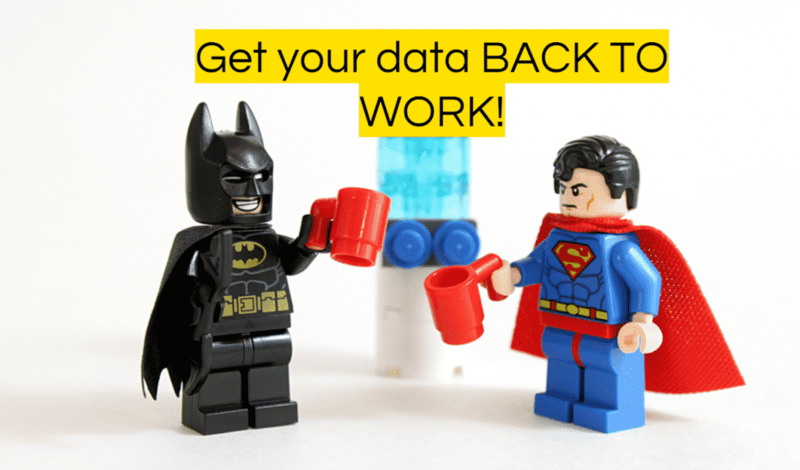 So it’s all about building trust for the data within the business and then using it to justify and prove the actions you’re all working so hard on. The higher the number, the best return for your efforts, but don’t just ignore the low numbers, they could be the long term gain items. And this scoring system shows you’re taking the business’ best interests into account, working out metrics such as EBITDA if required (if you don’t know what this means, then breath a sigh of relief that your data journey doesn’t have to get quite this detailed every time). This puts you in a great position to be working with stakeholders to justify the benefit your work will have to he business with their investment in you. Takeaway 5: Everyone loves a customer journey – but you can enhance it further! We’ve talked about segments and event tracking which are great tools you can use in Google Analytics and similar are available in other web analytics tools, now to talk about one of the best reports in recent history in Google Analytics – Enhanced Ecommerce. I remember first seeing this report around 5 years ago and being so excited and relieved that Google Analytics is now taking ecommerce retail businesses seriously and providing them with a great opportunity for funnel analytics. The change from Goal Funnels is huge, but you may not realise to start with, so let me just explain why you need to be using Enhanced Ecommerce, even if you’re a content based site (just apply this to your core journey by page type instead). The steps are measured when you fire the right tag, so it is never assumed that you have passed through a stage you may have missed. The reports can be segmented! The data can be viewed in a table! You can even create remarketing segments from them with just a few clicks. See the information around my site for more about what this can give you, as there’s a lot more to Enhanced ecommerce than the new funnel reports. I’ve also talked about this numerous times over the last few years, so see the other posts and slide decks for some examples of this in action. Don’t forget to use data to report on your success, learnings (never failure), opportunities and more. Build a data driven culture into your business with these foundations and you can optimise anything within the business!